There are five major types of metal bellows: rolled, hydroformed, welded, chemically deposited and electro-deposited. Electro-deposited bellows are manufactured by forming a mandrel to the shape of the inside of the bellows, depositing the proper thickness of spring quality metal onto this, trimming the ends and dissolving out the mandrel. 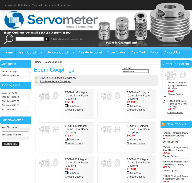 Servometer is the foremost manufacturer of electro-deposited bellows. These bellows have the following advantages over other types.